FCE Course Lesson 2 – An introduction to FCE speaking part 2 of the Cambridge B2 First Exam with exercises. 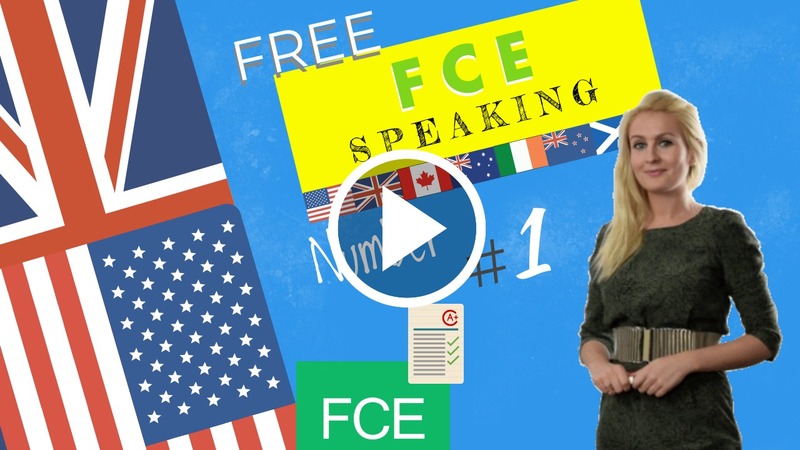 FCE speaking part 2 Dialogue Speaking Skills is about passing or failing the FCE. This lesson’s exam tip will be about SPEAKING PART 2. This part of the test is called ‘the Long Turn’ because both you and the other student (sometimes referred to as “Student B”) will take turns to give long answers or long speeches. Emma has invited her friend Susan along to join them. Susan took the exam a few months ago and unfortunately didn’t pass. Emma thought that Susan and Terry could discuss what it takes to pass an exam and why Susan may have failed it. SUSAN: Hey guys! Thanks for agreeing to have a chat with me Terry. TERRY: It’s my pleasure, I’m sorry that you didn’t pass. What do you think went wrong? SUSAN: Well, I think my nerves got the better of me. I passed the reading, listening, and writing sections of the exam but it was the speaking that let me down. TERRY: It’s to be expected. I remember that I was so nervous too but you just need to go into the exam thinking it’s not the end of the world if you fail. SUSAN: Yeah, I get what you mean. For the speaking though, my partner was so much better than me. I felt really overwhelmed and just messed it up because I couldn’t get any of my thoughts together. TERRY: Did you give bad answers all the way through the speaking? SUSAN: No, I think the first basic questions were good, I was feeling confident. The part where I had to compare my pictures wasn’t bad either. However, when it came to working with my partner, I could tell that she was at a much higher level so I felt very intimidated and couldn’t think of the vocabulary to give good answers. TERRY: The best advice I can give you is to see the high level of your partner as a benefit instead of a disadvantage. If your partner has really good vocabulary, you can work with them to expand on the answers with your own knowledge and before you know it, the conversation will be flowing really well. SUSAN: I suppose you’re right, I know they’re in the same boat as me and I should see them as a partner in the process rather than a threat to be scared by! TERRY: After taking the exam, has it made you wish you had done anything else? SUSAN: Yes, of course. It wasn’t until I sat the exam that I realised how much more I should have focused on specific grammar points like prefixes and suffixes. I should have sat down and worked through as much word formation as possible, focusing on different word classes and things like that. SUSAN: So Emma tells me you got 81%, you passed the exam with flying colours then. Well done! Obviously the exam went well but could you tell if it went smoothly at the time of taking the test? TERRY: I was confident about how everything had went, yes. Like you and like most people, I imagine, my least favourite sections were use of English and speaking. I got on well with my partner and when we came out of the exam, we were able to discuss the speaking and reassure each other about how it went. I was happy with myself because for the speaking I had revised a lot of vocabulary for describing the pictures and expressions of opinion, comparison and contrast. Did you do this? SUSAN: I think I could have focused more on what to point out in my descriptions, I will work on that a lot before my second attempt at the exam. TERRY: Yes, from the way I see it, descriptive vocabulary is essential. As for the use of English, I knew that I deserved to do well because I had focused my revision on the specific grammar points which come up in this part of the exam, knowing that was my weak point. Thank God justice prevailed because I had worked so hard! SUSAN: I know what I need to do now, thanks Terry. I have to admit that I feel a bit discouraged after last time and I’m not looking forward to coughing up another 200 euros but I’m desperate to take the exam again and pass. TERRY: Don’t feel too down in the dumps about it Susan. Of course, the financial aspect is a bit of a pain in the neck. That’s another reason why you need to feel completely prepared when going into the exam. Otherwise, if you fail again you will lose money and your confidence will be knocked. If you ever want to practise the speaking part, here’s my number. Just send me a message and we can meet up to chat in English, I’m happy to help you because I know how stressful it all is! A tip for the fce speaking part 2 Test. The day of the exam there are 4 parts in the FCE Speaking test. This part of the test is called ‘the Long Turn’ because both you and the other student (sometimes referred to as “Student B”) will take turns to give long answers or long speeches. In this part the examiner will give you two colour photos. You will have to talk about them on your own for 1 minute. When you have finished, the examiner then asks the other student a question about your photos – the other student should then talk for about 30 seconds. You shouldn’t talk when the other student is talking. Then student B gets two photos and has to talk about them for 1 minute. When he or she has finished talking, the examiner then asks you a question. You will now have about 30 seconds to answer. In this part of the test, nobody should interrupt you. There are (Verb +ing form, adjectives…)… in both photographs. Both of them have got… in them. The top one looks more… than the bottom one. This photo was taken during the day whereas/while the other photo was taken at night. The thing I like the best is…. She looks as if he is… (Verb + ing form). Do not describe the photos given to you. In any case the examiner will remind you of this: he or she will ask you to compare the photos and say something about them. Practise this exercise at home without setting yourself a time limit, then reduce the time you give yourself to produce an answer. This will help you when are under pressure during the day of the exam.